Examples show how task specific electrical stimulation can improve range of motion, (ROM), decrease spasticity (as resistance to passive stretch or motion) and improve upper extremity function and posture. NMES = neuromuscular electrical stimulation. TASES = task specific electrical stimulation. ES = electrical stimulation. 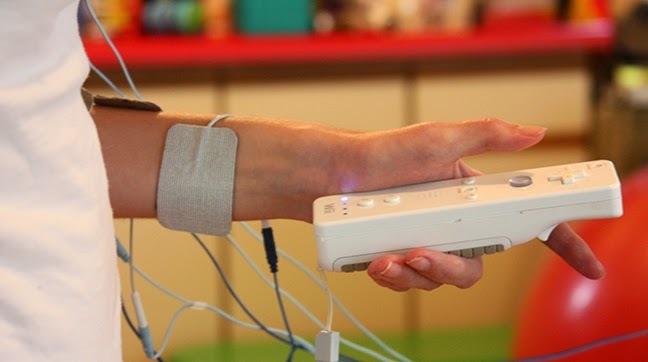 Electrical stimulation to the upper extremity can assist function, ROM and decrease spasticity similar to what it can do to the trunk and lower extremities. Children with CP are usually unable to contract the muscles adequately enough to hypertrophy the muscles so it has been recommended that ES be used. I also recommended that joints not be blocked with inappropriate splints or orthoses and that the muscles are encourage to be active when stimulated. When ES was first used in this clinic it was given to the traditional muscles (wrist extensors and triceps brachii) thought to be weak and lacking function. 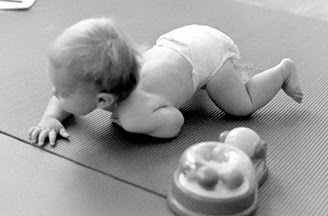 At 18 months of age this child was not able to crawl due to excessive upper extremity flexion. He is trying to crawl before receiving NMES. With it he was immediately able to crawl. After it was removed he had carry over so was still able to crawl. Before this 18 month old child (below) with left hemiplegia received TASES, he was unable to crawl. Immediately after receiving ES given task specifically (TASES) to his elbow and wrist extensors he was able to crawl without assistance. Carmick J. Clinical use of neuromuscular electrical stimulation for children with cerebral palsy, part 2: upper extremity. Phys Ther. 1993;73:514-527. ES to triceps brachii and wrist extensors helped his crawling not hand function. ES was then used for upper extremity needs to the triceps brachii, and wrist extensors. Soon it was learned that the spastic muscles were weak and needed sensory motor input. It was found that stimulation for sensory motor input improved shoulder and elbow reaching without ES to the triceps brachii. 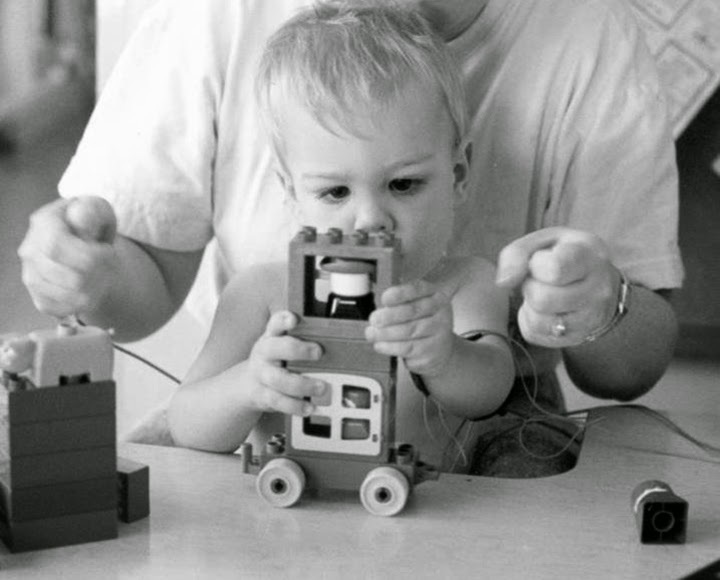 This child (below) at two years of age is using TASES to the finger, wrist and elbow flexors, and thumb abductors. The triceps brachii was not needed for reaching. 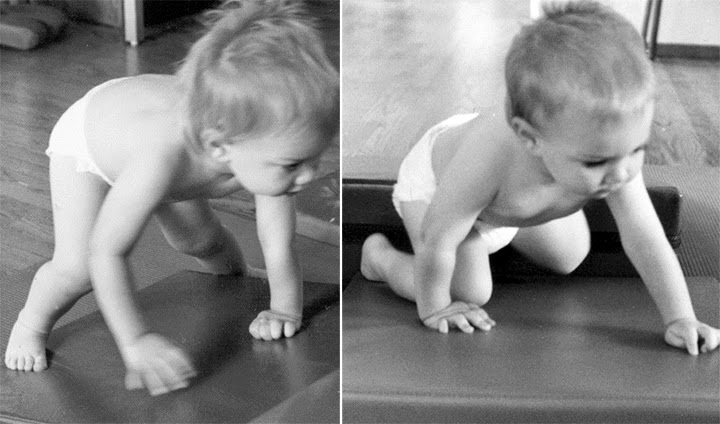 Perhaps this was because the initial sensory motor input to the elbow and wrist, gave the needed awareness to use it in reaching or that he had had it stimulated for crawling, or perhaps because he learned how to use the elbow and so used it for reaching. He is building with Duplo blocks, as TASES stimulates his left finger flexors and thumb muscles. He was then able to use two hands together and did not need to have constraint therapy. 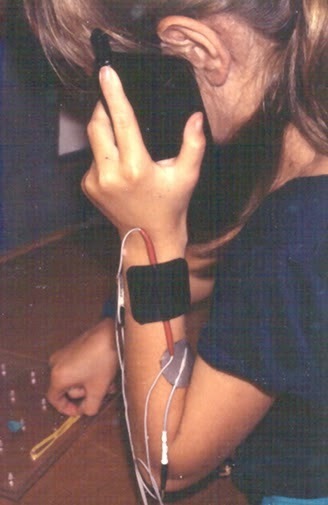 A remote switch held by the adult behind him in her right hand, is used to facilitate finger extensor or flexion as needed according to his task. Another child (below) with right spastic hemiplegia was evaluated for TASES. His parents stated that he never used the right hand and usually ignored it which is seen in the photographs. In the first two photos he is standing and playing with the left arm while the right arm is to the side or behind him not participating in any activity. The next photographs show the effect of using TASES to the right median-ulnar nerve for sensory-motor awareness. When TASES is used, the child willingly and spontaneously reached forward to get a ball from his mother’s hand and then put it in the ball run. 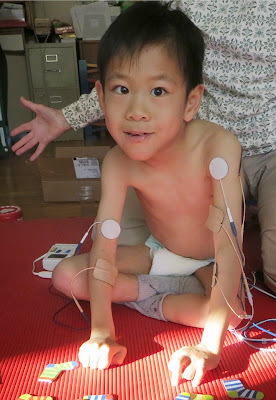 ES gave both a sensory and a motor input which appeared to motivate him to use the hand. Within a minute or so, the time needed to find an activity that he wanted to do, he opened his hand. A small ball was offered to him to put into a ball run. He reached out with the previously unused hand, took and ball and carried it to the ball run. He was able to put it in and to let go. I was surprised that he was also able to let go of the ball. The TASES was turned off when he was trying to release the ball. Twice was he able to get a ball from his mother and put it into the ball run. In this clinic it is recommended that ES be use to activate the muscles and that botulinum toxin or any other medication that has a sole purpose of decreasing spasticity not be used. It is necessary to activate various muscles for different tasks to see what works best for that child for that activity. TASES was used to the biceps brachii for children who had difficulty reaching and who lacked active and passive elbow flexion and extension. At first it was surprising to see that activating the biceps brachii improved immediately passive and active elbow extension. Here are examples of children who received that TASES to the biceps brachii during task specific PT. This child (below) is age 8, with mixed CP, GMFCS level V. He had great difficulty in holding his head and reaching the arms forward when he was younger. In the photos he was placed in sitting. When TASES was used to both biceps brachii and the left anterior deltoid, he was able to sit independently with his arms down and raise his head for a few moments without support. With support to the trunk he is able to maintain weight on the arms and keep the head up for many seconds. It is not necessary to have a high amplitude or near the 68% maximum voluntary contraction (MVC) as is often recommended. The amplitude is turned up slowly so the child experiences muscle activation and its sensation. One carefully observes the children and encourages them to do the activities for which the muscles are activated. As soon as the child begins to move and feel the contraction it may not be necessary to go to higher amplitude. Observe the child and go up only enough to obtain what is desired. One needs to watch for fatigue as muscles that are not usually used are activated and may fatigue excessively. 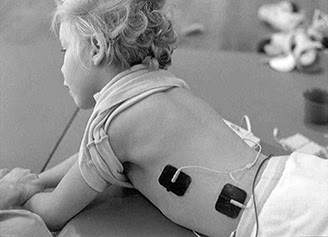 A two year old child (below) with severe mixed quadriplegic CP pulls her elbows and arms back toward the body when she is placed in prone. In the first picture on the right, the elbows are being blocked to prevent her from pushing back. She does not do a push up but she did lift her head up off the mat. After ES was used to the biceps brachii during a couple of PT sessions, she pushed up for the first time (below left). She was strong enough to get her chest just off the mat and then extended the elbows slightly is shown to the right. She pushed up and raise her head and upper trunk (below right). She continued to lift up her body and was so delighted when she pushed up more she made happy sounds. Some people are afraid to allow ES to activate spastic muscles for fear that spasticity and deformity will be increased. So when the child (below) began to receive ES at age 5 years of age, it was given only during PT and only to the lower extremities. After she was approximately 14 years of age the parents asked to try to use it to the right non-dominant hand to see if she could learn to get her hand to her mouth to be able to feed herself. Her OT was still concerned that the spasticity would increase so it was used only to the right biceps bachii as that was the non-dominant arm. 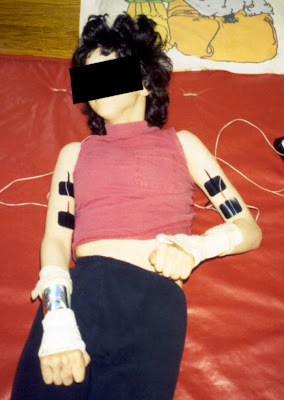 With ES to the biceps the teenager worked on obtaining control of elbow extension and attempt to sit with her arms down in her lap instead of up in a high guard position as is seen in the photograph before ES was given to the biceps brachii. After a couple of months the progress of active elbow extension was observed in the right arm but not the left which had not received ES. Her mother asked that ES be given the left dominant side. The first time it was used on the left biceps is shown here when she was 14 years of age. It was possible to easily get the arm passively into extension but she was not able to leave it fully extended long enough for me to pick up the camera to take the photo. The elbow flexed to the position shown as soon as I let go. The photo (left) shows a four-year-old girl who had never held an object long enough in the left hand to put it in her mouth. She does put her hand in the mouth but had never put a rattle or other item there. Here she is shown in supported sitting. 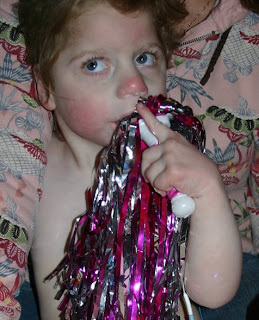 When NMES was used on the left hand, within a few seconds she was able to maintain grasp and put the pompom in her mouth and hold it there for at least a minute. The next five photos below show a twenty year old woman with CP, spastic quadriplegia. In the first view, (below) she is using her more involved hand on Nintendo’s Wii controller. She has difficulty maintaining grasp and pointing it at the screen because the arm has spasticity and she has difficulty extending the elbow and wrist and using the thumb. 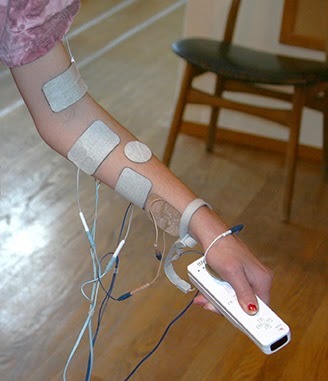 The second photo (below) shows improved ROM and ability to hold and use the Wii control as NMES stimulates many muscles. With practice in a few minutes she improved well enough to be successful and enjoy the game. 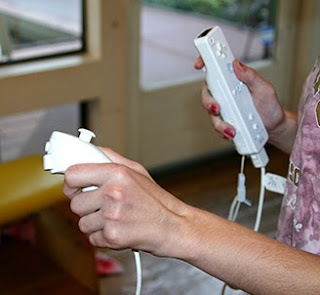 The third photograph (below) shows that she learned to control the thumb just enough and lift it on and off the button on the WII controller and not drop the controller. The fourth photo (below) shows her after NMES was removed and she is using the less complicated Nuk controller in the left hand without ES. She has good wrist position. Seven months later she has much increased thumb control as she lifts the thumb more quickly and higher when pressing the buttons on the Wii controller. Over time her thumb extension at the CMC joint and control improved. She is seen here extending the CMC joint correctly and flexing metacarpalphalangeal (MP) joint and interphalangeal l (IP) joints so that the thumb is able to flex and extend to operate the button on the controller. Of course wrist extension ES is at times needed and should be used during evaluations to see when it is needed and if it actually is needed or if the antagonist needs to be activated first for sensory motor learning. A 12 year old (below) had a hemispherectomy due to uncontrollable seizures. He was unable to use the hand and the wrist was in marked flexion. The plan before his first PT visit to try TASES was to surgically fuse the wrist. On the first visit ES was used for the ulnar and median nerves as well as finger and thumb flexors and extensors. He showed improved awareness and control with all the stimulated sites but needed stronger wrist extension. So ES was used to the wrist extensors. He returned a week later and was able to have a poor grade of wrist extension without using ES. He obtained a NMES unit and took it home with him and worked with his home therapist. His mother reported back to me that he continued to do well and learned to use hand. No wrist fusion was done. TASES is helpful for many muscles of the hand. Here the thumb appears to be at risk for dislocation. 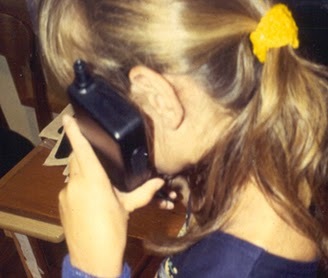 ES to the finger flexors and the pollicis brevis corrects the thumb position on the toy phone. TASES is used on the right thenar eminance (below left) in a child with mixed quadrapelgic CP, GMFCS level IV. She is supported in sitting as she reaches with her more involved hand to pick up a toy and place it in a cup. When the thumb abducted to assist the release, (below right) her mother and the child’s aide were suprised. TASES to the latissium dorsi results in shoulder extension, not the expected shoulder flexion. It helps reaching no matter what position the child may be, walking, prone, and sitting. This 4 year old child (below) with spastic quadriplegia, GMFCS Level IV was able to push up in prone and to extend the arms in front of her chest when TASES was used. Splints can be helpful for the hand but they can also prevent development and muscle function. They should be evaluated careful to see if they are beneficial or not. If the splint is helpful and allows movement the electrodes can be used underneath it to stimulate specific muscles according to the task. Below is the hand of a 16 year old girl with right hemiplegia. She was very motivated to play a guitar. However, her hand position made it almost impossible. A dorsal splint was made out of aquaplast to put the wrist in a neutral position. It was dorsal so not to stimulate the volar muscles to be in constant flexion. 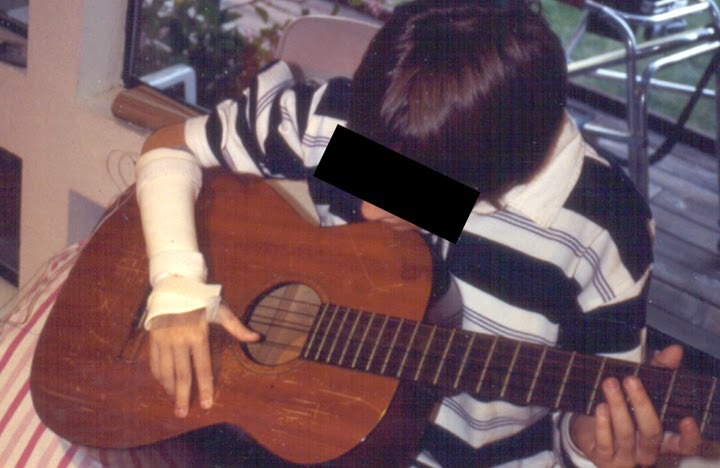 TASES/NMES is used under a dorsal splint which helps hold the wrist in an appropriate position so she can strum the guitar with the thumb. Two wires can be seen coming out of the proximal end of the splint. She did learn to strum the guitar while wearing the splint and progressed to be able to play without NMES. This splint helped the child control the wrist as she learned to use the thumb and fingers. Sometime splints can be so rigid that hand function is not possible. The child shown here came with such a splint. ES was not used with it as she would not be able to do anything with the hand as no joints could be moved. Wrist flexion and ulnar wrist deviation were not corrected in the splint. One needs to observe any splint or orthoses and learn what is the effect or outcome. Observe the problem and consider ways to help it. The first two photographs (below) show the child’s posture on the first visit when the splint was removed. Excessive wrist flexion, ulnar deviation and excessive proximal finger extension is seen. 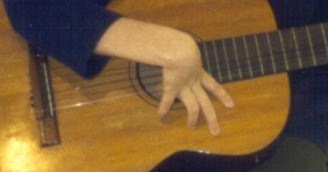 The thumb is also held in the palm of the left hand. Is the hand position improved more than without it? Is active movement prevented or assisted? Is the hand position improved than without it? Is active movement prevented or assisted? This photograph (below) shows the completed splint that a child wore when she came for the initial visit. There may be slightly less wrist flexion but ulnar deviation is increased and it is not possible for the child to use the hand or benefit from sensation of items in the hand when wearing the splint. Consider using ES to activate and use needed muscles for tasks to improve function, ROM and alignment and decrease spasticity. This was done and the splint was discarded.